Start your own affiliate program that will boost your sales and increase your brand exposure online. Join our affiliate network and thousands of other successful affiliates. Make more money from your website. Let our affiliates help you build your online presence. Start your own affiliate program and join thousands of successful companies. Affiliate marketing is the best way promote your business online and earn money by placing banners on your website. Read more about affiliate marketing. Almost every successful online business has an affiliate program because it is one of the most cost effective ways to promote your business, products and services online. Start your affiliate program. Our vision is simple: Create the best value and profit for our advertisers and affiliates. 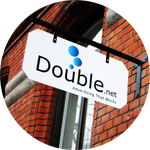 DoubleNet is one of the largest affiliate networks in Scandinavia with over 10 years of experience.